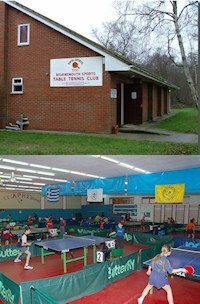 Charleston Table Tennis Club is based at the North Charleston Community Center, 2009 Seventh Avenue, Charleston, West Virginia, USA. The Center has plenty of parking, a well lighted gymnasium and hardwood floors. We take pride in the long history of the Club with many players having been members for 20, 30, even 50 years or more. These individuals have helped build an organization based on respect for each other, a love of the game of table tennis and camaraderie that good competition generates. We invite you to visit our Club and enjoy the game as it is meant to be played. League play begins each September, the first Monday after Labor Day and usually continues through April. The Center is closed on state and federal holidays. Open practice is from 6:00 to 6:25pm. League and round robin competition is from 6:30 to 8:45pm. The Club owns six professional tables. Membership and guest fees are modest. Full-time student's fees are reduced. Players range in ability from novice to expert with some holding national USATT ratings. Members and players come from all walks of life from attorneys to retirees. Over the years we are proud to have counted many women among our members. Play is competitive, fast and by the rules, but friendly. Whether your skills are at the church basement/garage 'ping pong' level or the expert level, if you’re interested in moving your game up to 'table tennis' – come see us at the Charleston Table Tennis Club. You'll find someone to play and members willing to help you improve your game. CTTC is hosting the West Virginia State Table Tennis Championship 2011. The club has been in existence over 50 years. It's the largest club in West Virginia with 8 premium tables. Visitors are welcome. We play at the North Charleston Rec Center. Turn off Washington on 21st Street, then left onto 7th Avenue. No cost for visitors, then $25 a year to join. The club is open during the school year. We play from 5:30 PM until 8:45 PM on Monday evenings. We have 8 tables, a wooden gym floor, great lighting, high ceiling and plenty of room. On a typical night we have between 15 and 25 players. We play a round robin format and will play some teams as well. We have great tables, great members, and a computer program that directs the round robin format and it develops an unofficial USATT rating.